PS LCR6V1.3P Battery - Lil'DMXter Battery -- Goddard Design Co. These replacement batteries for Goddard Design Company's Lil'DMXter and DMXter4 RDM. They may be used in our model numbers FD_DMX-1, FD_DMX-1A, FD_DMX-1B and DMX-4. 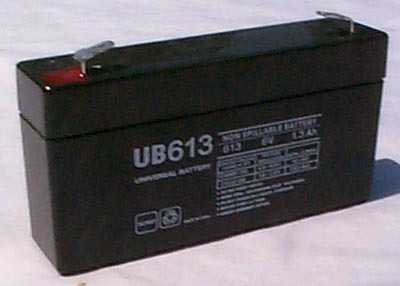 This sealed lead acid rechargeable battery is also used in many other industrial applications. Goddard provided batteries are labeled for use in our equipment. If installing in a DMXter make sure that it is placed with the side labeled "This Side Up" facing the front panel. For other applications follow the makers instructions. Note that GDC- provided batteries are rated at 1.2 amp hours while some standard industry batteries are rated at 1.3 amp hours. These batteries are a compact efficient power source designed for long life in float and cyclic applications, durability and dependable service. Suspended electrolyte allows batteries to be mounted in any position. The connections are made via 187" faston tabs. We take MasterCard, Visa and American Express credit cards.